Join us for a demonstration of the Gatan Precision Etching and Coating System (PECS II) in Sweden on 6th-10th May 2019. 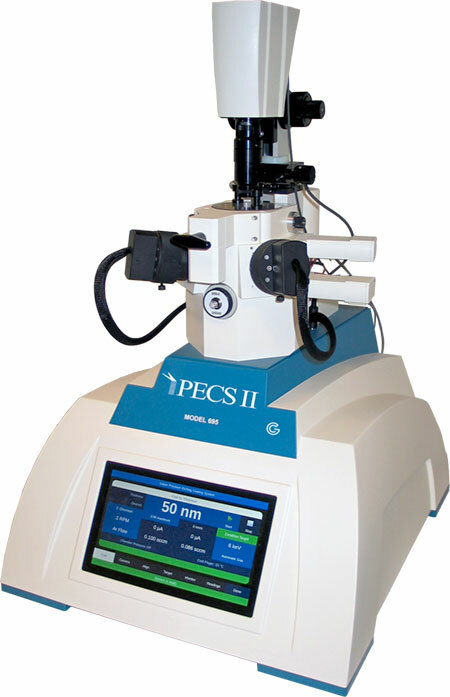 PECS II is a sample preparation system for SEM, SPM and optical microscopy, for polishing surfaces, removing damage and coating specimens. Blue Scientific is the official distributor for Gatan in Norway, Sweden, Denmark, Finland and Iceland. For more information or quotes, please get in touch. Together with Gatan, we’re holding demonstrations of their Precision Etching and Coating System (PECS II) in Sweden. The demos will be held in Stockholm and Gothenburg on 6th-10th May 2019 with Chris Spence, an Applications Specialist from Gatan in the USA. All are welcome; please contact us to book your place (details below). 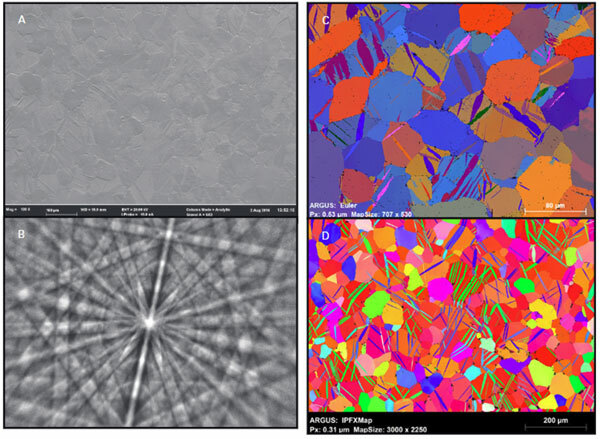 Produce specimens suitable for imaging, energy dispersive X-ray spectroscopy (EDS), electron backscatter diffraction (EBSD), cathodoluminescence (CL), electron-beam induced current (EBIC) and other analytical techniques. (A) PECS II polished SE image of the surface showing highly twinned grains. (B) Kikuchi pattern from Zircaloy after PECS II polishing. (C) EBSD Euler angle map. (D) IPFZ map. Courtesy of University of Oxford. All are welcome; please contact us to book your place and let us know your area of work, so we can make sure the demo is relevant to you. To reserve your place, contact Tripta Kamra on tripta.kamra@blue-scientific.com or +46 701 411 222.